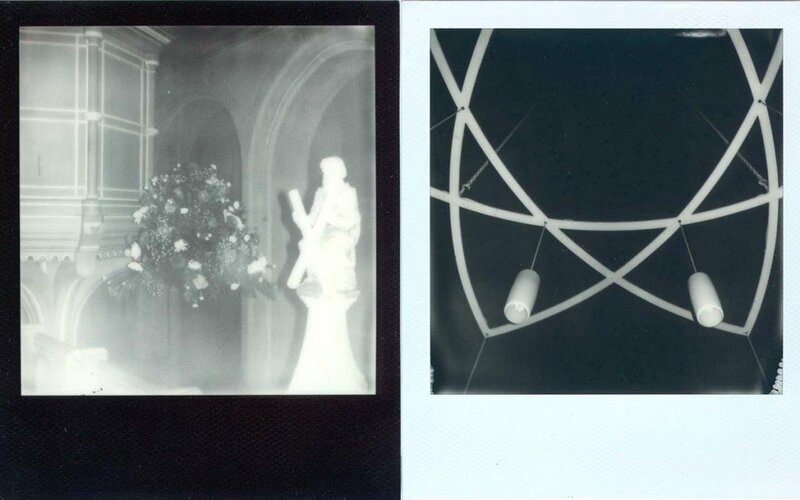 In Everett’s large scale Polaroids, space and form emerge seemingly from lack of context and are yet charged with possibility, becoming amorphous as well as interchangeable. These works form part of an on-going night time duration at St John the Evangelist, St Leonards. Installed within the meditative space offered by the church, Everett’s photoidentity surrenders into anonymity, enabling the passive joys of facelessness or the more active pleasures of imagining. As a result of the contrast of familiarity by day, by night everything in sight falls secondary to the stillness and solitude of the space. The act of looking encompasses the viewer, and takes precedence over the object of the gaze. The eye, attempting to make distinctions in the blackness, sees sameness instead of difference; as the individual, hypnotised by nothingness, becomes blind to the world of detail. The interior of the church dematerialises as the focus shifts from manifestation to perception. This is enhanced by the explosion of flash and subsequent immediate disorientation. Everett writes: ‘I wanted to experience the profound slowness of time passing combined with the immense emptiness of the room. Coupled within my developing thoughts toward the modern affects of detachment, and the dichotomies of extreme speed and interminable waiting, the work points to a world thus surrendered to solitary privatisation. The intention is that these spatial plays evoke a sense of individuality, and that it is precisely individuality that is being dissolved, or partially lost. Perhaps the viewer confronts in every plane an image of self: the only face to be seen and the only voice to be heard, is one’s own, yet somehow responded to and echoed back many times over”.